Reading Manipulatives has discontinued production of printed, laminated materials due to changing market conditions. Low-cost digital downloads of our extensively used and tested materials are now available. The PDF files include all manipulatives or task cards from each product. In some products, worksheet alternatives for manipulatives are also provided. Guides correlate skills to Common Core English Language Arts Standards and contain teaching strategies, resource lists, and student recordkeeping checklists. 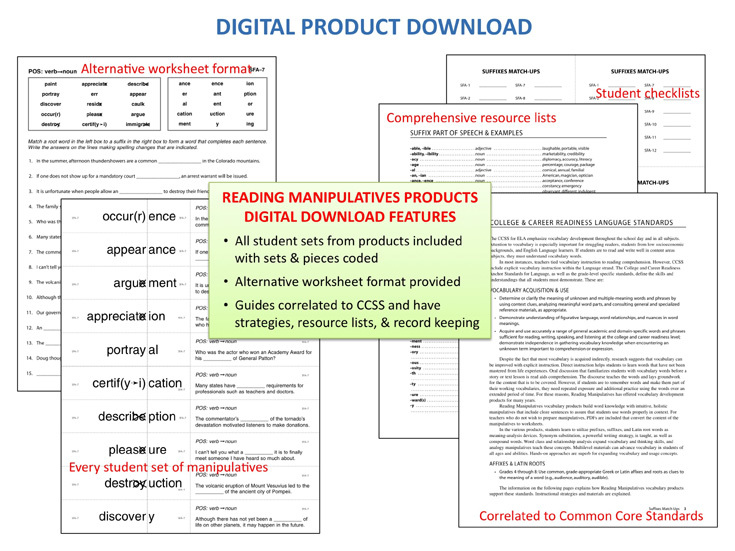 Digital downloads are also available on TeachersPayTeachers.com in the Reading Manipulatives store. The Common Core State Standards (CCSS) aim to ensure that K–12 schools in the United States prepare every child for college or careers, ensuring that students have necessary knowledge and skills to be globally competitive. The standards set clear goals for student achievement but do not specify how to impart the skills. Teachers need guidance on how to restructure curriculum and plan instruction so they can achieve CCSS goals. Student motivation is crucial to advancing skills, and engagement is necessary to sustain literacy activities. Research tells us that children are motivated by choice, challenge, success, and social interaction. Reading Manipulatives products provide all of these. A classroom literacy lab stocked with complete sets of Reading Manipulatives materials can assure that students of all abilities in a classroom learn needed skills. Reading Manipulatives products are comprehensive skill-development activities. The complete sets cover all aspects of targeted skills. Once students are introduced to the skills and shown how to do the manipulatives or task cards, they are able to work independently through the entire series. By the time they complete all the sets or cards, students demonstrate skill proficiency. Select materials that target a wide range of applicable skills (phonics, vocabulary, comprehension, language) and instructional levels. An effective classroom literacy lab must meet the needs of all students. Also, organizing the printing, especially if you are going to have them commercially printed, will be far easier if done in blocks. It will be a big job, but keep in mind that once prepared, these durable materials should last for years. PDF pages are designed to be printed on 8.5 x 11 inch sheets of cover-weight paper. Ideally, printing should be done on a commercial digital printer. Copy shops have equipment that prints on cardstock in perfect alignment, and the ink goes almost to the edge. They can provide a wide array of paper options and you would not have to purchase more than you need. Reading Manipulatives used Wausau Astrobrights 65 lb. cover. Most materials are single-sided and can be printed on a desktop laser printer if it handles cover-weight paper. Double-sided materials would be more difficult to print on laser printers. These individualized activities are the type of systematic and explicit instruction that the literacy community advocates. Each product has enough sets to impart the full range of skills. Multi-levels are available, allowing proper placement of every student without the stigma often attached to remedial products. CCSS states that students advancing through the grades are expected to meet grade-specific standards each year and retain or further develop skills and understandings mastered in preceding grades. A well-stocked literacy lab can make this goal manageable, allowing every child to work at the correct instructional level as skills are developed.